Rat & Mouse Poison Trays are designed for use with our range of grain baits. 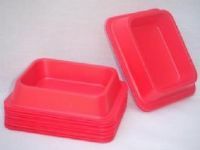 These bait trays provide open feeding points for rodents, these are typically placed underneath kitchen sinks, kitchen units, or wherever mouse or rat activity has been noticed. They are also suitable for mice in lofts, mice in sheds, garages etc. Care should always be taken when laying rat or mouse poison, ensuring that it is inaccessible to pets, children and any other non-target species. To enable securer and safer use of rodenticides, please see our auto-locking Rat & Mouse Bait Stations.